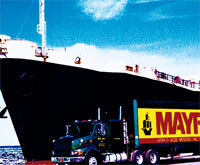 We are an agent for Mayflower Transit, Inc., the most recognized name in household moving services. Mayflower understands that moving can be one of the most stressful periods in a person’s life. After all, we have been moving families for generations. 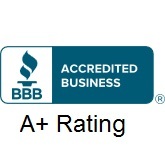 Mayflower has highly trained professionals which can help you every step of the way. From carefully packing your belongings, cautiously loading our vans, to setting up your furniture in your new home, Mayflower is here to assist you. Choose Mayflower – The Name You Know. 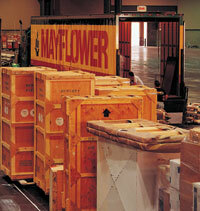 For more than 30 years, Mayflower has been providing international and cargo relocation services. With a network of more than 700 worldwide agents, Mayflower has the resources to move your family or office as well as providing help to get acclimated into a new culture. 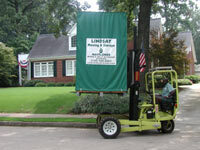 Armed with the ability to handle your office relocation, Lindsay ensures your move is convenient for your business. Our moving counselor works closely with you to ensure your office is relocated to your exact specifications. 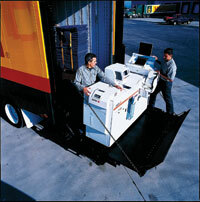 Our moving services are designed to keep from disrupting your employees during crucial business time. Mayflower Transit now allows customers to track the status of their moves on the Internet. To track your shipment, you will need to know your order number. If you are a National Account then Click Here to track your shipment. If you are a Residential (C.O.D.) Customer then Click Here to track your shipment. Do you ever have enough space? Even if you have enough room to accommodate the everyday clutter, what about seasonal items, extra furniture, family heirlooms, etc. — things you don’t need right now, but may need later. Things you don’t want to use, but can’t bear to lose. For easy, convenient, economical storage for home or office use, call for delivery of a revolutionary HomePak storage container. The contents of your securely stored container are available to you whenever you need access. 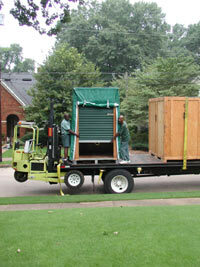 Containers are available for delivery, or you may visit the storage facility.